This paper describes the work of a research group, created in Fall 2014 at the University of Maryland, Baltimore County (USA), which compares international television format adaptations using digital tools such as Final Cut Pro™, Adobe Premiere Pro™, Microsoft Excel™, and Atlas.ti™ and Multimodal Analysis™. These allow for comparing and contrasting different versions of television series that have originated in one country and have been reproduced with a different cast, in a different location, under different contexts, material conditions, and televisual narrative conventions in other countries. This research group brings together doctoral, masters, and undergraduate student researchers into interdisciplinary collaboration. New participants are welcome to join at any time and are recruited from classes on global television and intercultural communication. The group’s ultimate objective is to develop a valid cross-cultural methodology for comparatively analyzing different iterations of the audiovisual texts on the basis of qualitative and quantitative temporal data collected and compiled with the aforementioned digital tools. We define a ‘televisual language’ based on film semiotic theories by Christian Metz,1 James Monaco,2 David Bordwell3 and others, and applying these ideas to initially comparing the pilot episodes of television series produced in two countries. Each member of the research team collects, compiles, compares, and visualizes data from two different versions of the particular series. These include the Canadian/Quebecois TV series Les Bougon, which was reproduced in France under the same title. Another researcher is analyzing the Turkish version of the US crime comedy Monk, entitled Galip Derviş. The directing faculty scholar will compare one episode of the 1950s German crime show Stahlnetz (‘Die blaue Mütze,’ ARD, 1958) with one episode of the US original, Dragnet (‘The Big Seventeen,’ NBC 1952). Michel Chion underscores the significance of sound in the temporal constitution of the cinematic text when he states that sound “temporalizes images” by temporally animating the image, providing shots with temporal linearization and directing the drama of a shot towards a goal.11 Our research project therefore assumes that each particular television series can be conceived of as a language with a temporally constituted, and therefore quantifiable dimension amenable to cross-cultural comparative analysis incorporating a variety of components. It emerges within the context of the specific material, historically evolved conditions underlying the television industry in each country, including the historically determined, transnational institutional configuration of television production, distribution and consumption, genre development and audience behavior and expectations. Each researcher will introduce this quantitative dimension to the comparative interpretation of each version of the television series, and incorporate it into the cross-cultural comparative analysis. 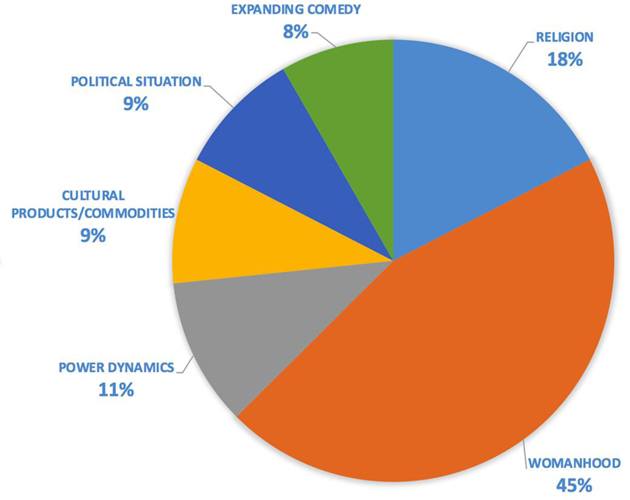 One of the primary conceptual instruments of analysis for comparing television formats is ‘cultural proximity,’ defined as the preference of television audiences for audiovisual narratives that ‘are close in cultural content and style to the audience’s own culture,’12 which include aspects such as “language, ethnic appearance, dress, style, humor, historical reference, and shared topical knowledge.” Straubhaar’s definition reveals that cultural proximity comprises more than a laundry list of typical cultural references in one version which are replaced with different ones in another, for instance those regarding school grading systems, sports teams, or political and social institutions.13 Cultural proximity extends to aesthetic conventions, institutional broadcasting configurations, and audience preferences and habits. The digital tools enable comparisons of components of the narrative structure and content not only in cases of relatively similar versions of episodes in a formatted series, such as The Nanny, which are equal in length and narrative sequence, or even Monk, which is similar in narrative sequence but shorter in duration than the Turkish remade version, but also of series which may demonstrate less structural similarity to each other, such as Les Bougon and Stahlnetz. 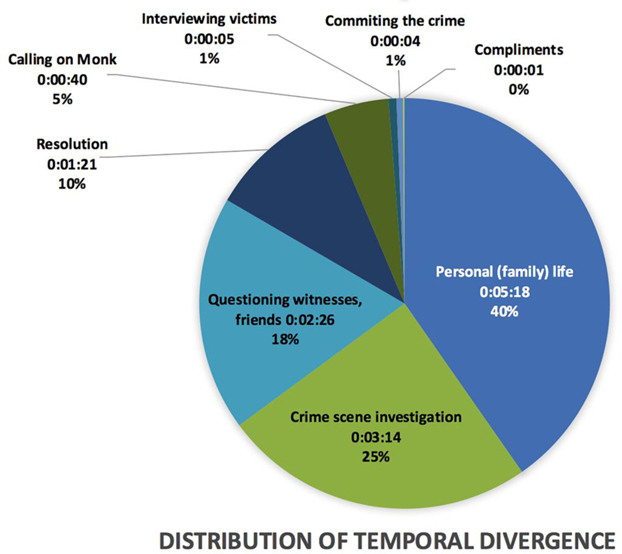 In addition, while the former cases may be comparable on the structural level of single episodes (Doc Martin, The Office, or Monk/Derviş), other cases, such as different episodes of Dragnet and Stahlnetz have no one-to-one episodic similarity and diverge quite substantially from each other in narrative structure and duration, even topic and film aesthetic techniques. Comparisons of these are therefore rooted in similarities of genre structure and sequencing. Digital tools offer instruments for both quantitative and qualitative comparison, and help us construct a typology of three different – sometimes intertwined – adaptation strategies reflecting different qualities of adaptation,14 involved in the transnational format trade. Transposed Narrative: Narrative structure, content, and sequencing remain largely unchanged, with modifications merely to certain aspects of the story to enhance cultural proximity, such as location, actors, cultural, institutional, and historical references. One example of this are the various iterations of the US sitcom The Nanny, reproduced in Argentina, Russia, Poland, Greece, and Turkey, among others. We will not go into detail about this example. A further example of a transposed narrative is when the narrative structure, content, and sequencing are retained, but certain sequences, scenes, and shots are expanded and extended to accommodate longer broadcast slots, in which new characters, storylines, shots, and scenes are added along with other modifications for greater cultural proximity. This is the case with the Turkish version of Monk, Galip Derviş. Transmutated Narrative: The narrative structure, content, and sequencing is redistributed and re-organized in the adaptation, creating a new composite narrative, perhaps even resulting in a new genre configuration, in addition to the modification of cultural proximity aspects mentioned in the previous two examples. The French version of the Quebec series Les Bougon exemplifies this. Derived Narrative: The narrative structure and content has been radically modified, while the adaptation may be based not on episode similarities such as in the previous cases, but are comparable based on genre similarities. Examples of this include the German adaptation of the US Dragnet series in the 1950s. Digital tools enable the collection of temporal data within a multimodal analysis to more precisely define and delineate boundaries between, and quantify each particular typological classification. Our research group embarked on a search for the most suitable tools of analysis and through a process of experimentation and elimination used the applications mentioned in this paper for particular purposes. Each software helps derive different types of data and our first choices were the two major video editing programs, Final Cut Pro and Adobe Premiere Pro. As depicted in the chart below, we first used Final Cut Pro for video editing and comparative visualization of scenes to detect similarities and differences in scene and shot length, lighting, dialog, music, and composition. We have not used Final Cut, which is typically used for film editing, for segmenting, deriving quantitative data on and measuring the length of aspects and modes of communication such as scenes, shots, dialog, music, or camera work. Adobe Premiere Pro, on the other hand, has been used to measure and compile data on these kinds of segments. The segment bar in Adobe Premiere is a separate function bar located directly above the timeline, and the segments can be color coded, moved, and their in and out points shifted if need be. This is not possible in Final Cut Pro and is therefore preferable to Final Cut for this step. However, Adobe Premiere Pro is only able to do this for one video at a time, and can only assemble information on one aspect at a time, e.g., primarily narrative structure. Atlas.ti, a program designed for collecting ethnographic data in print, audiovisual, and visual documents, can be used for segmenting multiple videos at the same time, and permits the segmenting and correlation of multiple modes and aspects of communication with each other. However, we have found this program, which is advertised as an instrument for qualitative analysis and works best with printed documents, to be prohibitively complicated for our purposes, especially when attempting to compile data from multiple modes and aspects of communication from the timeline. An additional weakness in the Atlas.ti program for our purposes was the inability to automatically compile the elapsed time of a particular segment into a column in an Excel table. While the program calculates the elapsed time of the segments (whether ‘quotations’ or ‘codes’) on the timeline, this elapsed time must always be added to the file name manually in order for it to be incorporated into a column on an Excel table. Adobe Premiere Pro accomplishes this automatically through the segmenting function and is therefore easier to use. Through its ‘network’ function, however, Atlas.ti is, in theory, able to display and compare different kinds of visual information and their relationships to each other, something that will be demonstrated further below. Due to these limitations and the dearth of space for this article, we will dispense with a detailed description of using Atlas.ti for our comparative analyses and focus on the four other tools at our disposal. The most useful program for our work is the Multimodal Analysis (MMA) program, which, although it permits the analysis of only one single video at a time (for instance, one episode of the series), allows the application of multiple categories of data collection that none of the other programs are able to provide. Compared to Atlas.ti, which also allows for multiple categories of collection of audiovisual data, the presentation and mapping of this data on the MMA timeline is more intuitive and better organized. Both Atlas.ti and MMA offer the possibility of user-generated categories of data collection, in the parlance of Atlas.ti these are known as ‘quotations,’ in MMA these are known as ‘nodes.’ The keywords of each can also be user-generated in both programs, but only MMA offers a comprehensive number of default keywords called a ‘library,’ which can be modified or expanded according to the needs of the researcher. In our future projects, we will focus our attention on using the MMA program for our comparative analyses. In our work, the data derived from Adobe Premiere Pro, Atlas.ti, and MMA can be exported using the csv format to a Microsoft Excel table, where the quantitative data can be compiled, color-coded and prepared either by means of raw data (elapsed time in minutes: seconds) or by using percentages of total run time. All applications mentioned in this paper are capable of color-coding segments, which may be unified for cross-platform identification. While it is possible to create only eight different color-coded segments in Adobe Premiere Pro, exporting the data to a Microsoft Excel table increases the range of possible color-coding substantially. 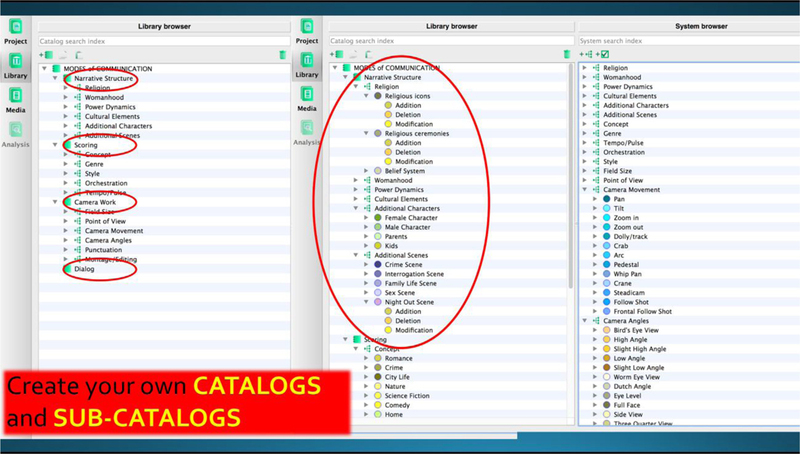 Atlas.ti also offers an opportunity for color-coding segments, but only as ‘codes’ (keywords) according to which the ‘quotations’ are classified. It is not possible in Atlas.ti to color-code ‘quotations.’ Exporting the data to Microsoft Excel alleviates this problem, however, when working with the quotations in Atlas.ti. Microsoft Excel currently remains the application of choice for the presentation, depiction, and comparison of the quantitative data before it is applied to the interpretive cross-cultural analysis. We will illustrate the typologies and software applications in the following sections. Transposed narratives are adaptations that retain the narrative content, sequencing, and structure of the source narrative with modifications of minor aspects to enhance the cultural proximity of the adapted version. Despite the retention of the overall narrative structure in general, minor modifications play an important role in the reproduced narrative because, first, what is being added or deleted discloses culturally specific information about the new ‘idealized’ viewer group; and second and more importantly, as Bateman15 says, “once the unity of [an] event is broken, space is opened up for considerable variation. [And] what can happen between segments is almost endless.” In other words, minor modifications may sectionalize events and stories, and thus affect how a narrative is perceived. In this sense, reading narrative structures temporally and holistically may unveil meanings and patterns that cannot be apprehended through other means. In the rest of this section, we will look at an example of a transposed narrative, namely Galip Dervis, the Turkish adaptation of a US comedy crime series Monk, and analyze its narrative structure temporally and holistically with the help of the video analysis tool Multimodal Analysis (MMA). Monk is an Emmy Award-winning American comedy crime series created by Andy Breckman, an American television and film writer, and produced by Mandeville Films and Touchstone Television in association with Universal Television between the years of 2002 and 2009. It consisted of eight seasons with a total number of 125 episodes. Its high ratings and long-lasting success in American television inspired two Turkish brothers, Ahmet Kayımtu and Mahmut Kayımtu, to reproduce the series with a different cast in Turkey in 2013 under the name of Galip Derviş.16 The Turkish remake was aired on Kanal D between the years of 2013 and 2014, and it consisted of three seasons with a total number of 56 episodes. One of the most salient and inceptive forms in which the process of re-interpretation manifests itself in Galip Derviş is a consistent extension and expansion of almost all scenes in all the reproduced episodes. As a result, the average 44-minute-long episodes of Monk are transformed into approximately one-hour-long episodes in the Turkish adaptation. According to Turkish producer Ahmet Kayımtu, this temporal adjustment of the adapted episodes by a predominant extension of almost every scene stems from the fact that the accepted average length of series in Turkish television is around 90–100 minutes.17 He explains this cultural tendency in two ways: (1) producers strive for higher ratings by making their shows longer than other shows18 and (2) broadcasters prefer longer shows in order to derive more profit by incorporating more TV commercials into longer shows. In cross-cultural adaptations, these time-economic strategies frequently dovetail with interventions for achieving ‘cultural proximity,’ as the extended time is mostly used for localization purposes. In other words, the distribution of temporal divergence (extensions, expansions, reductions, and deletions) among various different stages of the narrative structure usually shows traces and markers of the topics where the most extensive cultural re-appropriation takes place. Figure 1. Multimodal Analysis (MMA) – Library. Figure 2. Multimodal Analysis (MMA) – Analysis Page. The 91-minute-long pilot episode of Galip Derviş, entitled “Başkana Suikast” (“An Assassination Attempt on the Mayor”), which was adapted from the 78-minute-long pilot episode of Monk, entitled “Mr. Monk and the Candidate,” lays bare this close relationship between the time economy of TV series adaptations and the processes of cultural appropriation and localization. In order to find an answer to this question, we delve into individual scenes and analyze the nodes in correlation with different catalogs and sub-catalogs we have used to segment the text in the MMA. The first set of data in Figure 5 indicate that almost half of the temporal divergences are related to ‘womanhood.’ This pattern can be interpreted as a reflection of Turkey’s political history. Turkey is a country that was founded on the ashes of the Ottoman Empire about a hundred years ago, and its state ideology was built upon ‘secularity’ and ‘westernization’ in the name of ‘modernization.’ Within this context, women played a key role in the implementation of the new state ideology because emancipation of women, especially from her veil, which symbolized her connection to the state’s oriental roots in orientalist western discourse, was a prominent step toward modernization. On the other hand, the new state also had to preserve a national identity that was going to help distinguish itself from other European states. In this sense, certain features of the existing patriarchal society, such as motherhood, honor, sexual propriety, and family, were kept central to the nationalist agenda of the new state, as women were imagined to demarcate the boundaries of the new national identity. In the end, the emancipation of women was not a pure act of liberation. This double-edge state ideology created the ideal of “modern but modest woman” or “the emancipated but unliberated women.”21 In this regard, the results of our analysis of the temporal divergence are crucial in the sense that they overlap with the state’s long-pursued national identity in Turkey, for which women play a crucial role. The second set of data, shown in Figure 6, is derived from the sub-catalogs of ‘womanhood,’ and it provides us with a more detailed picture of the adaptation process. 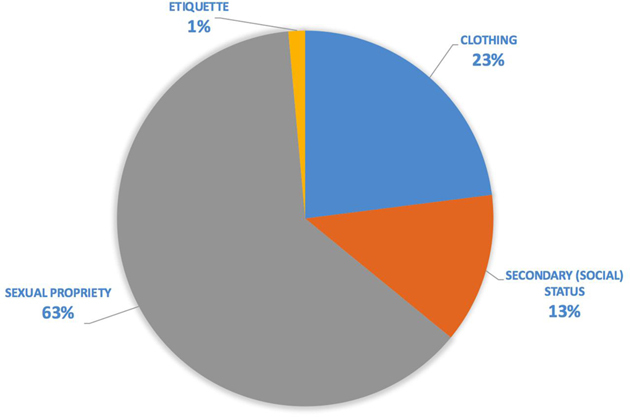 For instance, in the chart above, we only see a 23% divergence in clothing because, as we have stated above, the state’s secular and Western ideology allow women in Turkey to appear ‘Western.’ On the other hand, her sexual propriety constitutes 63% of the divergence because her personal life and relationships have always been expected to comply with the state’s preserved nationalist agenda. The following excerpt is an epitome of how the private life of the main female character Hülya Uçar (Algı Eke) and her son Yusuf (Ege Gürel) is constantly monitored and regulated in the Turkish remake by a newly added character, Hülya’s mother Pervin Uçar (Deniz Türkali), who lives with the two. This particular scene as well as many others that do not exist in the American version show how the values of ‘womanhood,’ ‘divorced life,’ ‘honor,’ ‘women’s work life,’ and ‘family life’ are tailored to existing socially accepted local norms. Video 1. Monk/Galip Derviş Adaptation (Family Life). Go to the online version of this article to watch the video. Overall, this analysis demonstrates that the temporal data gathered from audiovisual narratives offers researchers an innovative way of interpreting audiovisual texts in order to uncover patterns and aspects that may not be apprehended through other means, especially when one wants to more precisely work out what and how the expansions and extensions are constructed in the narrative. By transmutated narrative we refer to the redistribution and restructuring of similar or in certain cases new narrative segments and sequences and creation of narrative bridges or connections to re-establish narrative cohesion. The transmutation adaptation technique consists of combining different episodes of the original version to create a single original narrative. The adaptation process of Quebecois show Les Bougon for the French audience showcases this technique. In using a quantitative method and digital tools (Final Cut Pro™, Excel and MMA), we will see how the transmutation affects three key moments of the French episode, namely the beginning, the middle and the ending. Les Bougon is originally a Quebecois TV series that was broadcast on Radio Canada for three seasons (2003–2005). It contains a total of 50 episodes of approximately 22 minutes each. The French adaptation, Les Bougon, ran for one season only and was broadcast between 2008–2010. Each episode lasts between 45–55 minutes. Both versions of Les Bougon portray a dysfunctional family of five who live off petty crimes and other illegal activities. Quebecois scriptwriter François Avard created the series to criticize, from the standpoint of the marginalized communities, the chaotic and unruly society run by corrupt institutions. It was adapted for French TV by French writer and Director Sam Karmann. One of the interventions Karmann made in the adaptation process involves duration. In order to fit the prime time format of French TV, which usually airs 55-minute-long shows, Karman combined different episodes of the original show. Another change involves intervention in the controversial content of the show. Unlike the Quebecois, who generally perceive TV series as a vehicle for social critique, the French TV industry tends to see TV series as ‘mere’ entertainment and avoid controversial issues. Hence, sensitive topics such as drug abuse have been blunted and defused. Both of these interventions will be addressed and discussed in this part of the paper. The French pilot lasts 00:47:17. It is a combination of Quebecois episode 1 and 2 lasting 00:21:21 and 00:21:28, respectively. 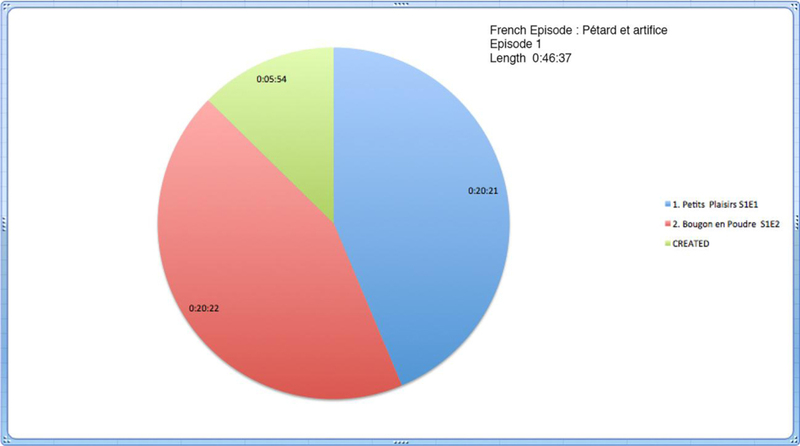 Figure 7 illustrates the time economy of the French episode, which comprises the total narrative of both Quebecois episodes and an additional 00:05:54 of scene extension and creation to achieve a full-length episode. Editing software Final Cut Pro™ enables us to reverse engineer the editing of the scenes’ sequence and uncover the process of the scenes’ restructuration. 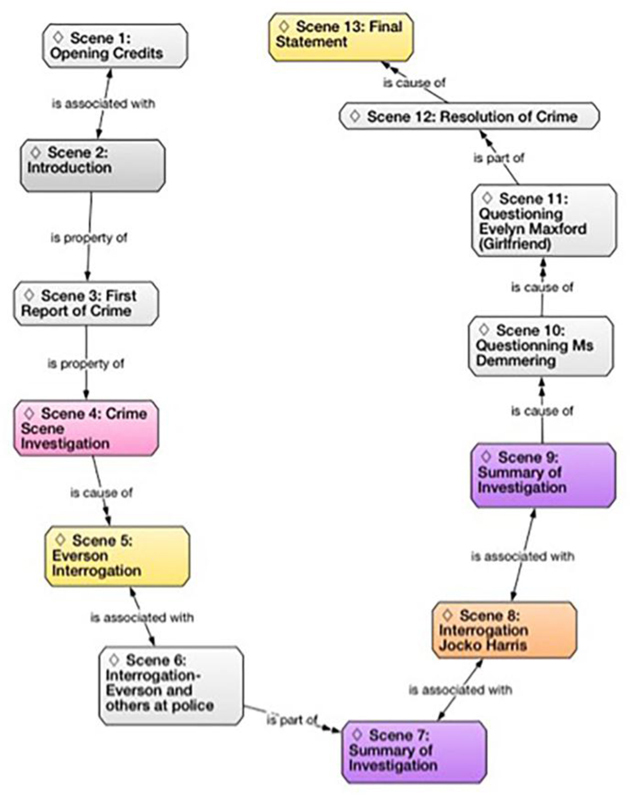 Clip 2 illustrates the reshuffling of the scenes and the modification of the narrative structure. The two Quebecois episodes are placed one after the other above the French one in the timeline. Next, the episodes of both versions of the show are divided into scenes. Finally, the scenes of the Quebecois episodes are moved around to be synchronized with the corresponding scenes of the French episode. Video 2. FCX Timeline French Episode 1 “Pétards et Artifices and Quebecois’, Petits Plaisirs, scenes rearrangements. Go to the online version of this article to watch the video. This method reveals effectively how the French director appropriates the Quebecois narrative structure by using it only at his own discretion. French Director Sam Karmann lengthens, shortens, divides, creates and replaces Quebecois scenes and reorganizes them to build a single French episode. Hence Les Bougon becomes a French collage of Quebecois parts to become its own entity (see Figure 8). Using Final Cut Pro™ facilitates the comparative analysis of scenes. This technique reveals three major changes in the narrative structure of the French episode. The Quebecois series generally starts with a cold open22 and thrusts the audience into an action scene from the very beginning. In each episode, this opening recurs followed by a kitchen scene where the family gathers to plan and elaborate the daily crimes. In the French version however, the sequencing of the scenes is reversed. The kitchen scene always comes first and is followed by the action scene. Such reorganization might be explained by the fact that the French narrative is based on two days that need to be clearly identified. The kitchen scene serves as a marker from which the narrative develops linearly, so not to unsettle the French audience. At 25:34:18 in the French episode, scene 14 (00:00:39) was created ex-nihilo to bridge the two narrative structures of the Quebecois episodes. Since each Quebecois episode corresponds to one day, the French created a night scene that connects the two days in order to create a single coherent plot. The French and Quebecois episodes have different endings. Quebecois episode 2 ends on a dramatic note while the French episode has a happy ending. In the Quebecois version, Paul, the patriarch, engages in a serious talk about drug use and the risks it entails. The daughter, who used the drugs, is left by herself as the family leaves. On the other hand, the French episode ends with a prank related to drugs and the gravity of drug use is less dramatized. The last scene pictures the family gathered and laughing about the situation. Clip 3 and 4 clearly demonstrate the dichotomy in atmosphere between the two shows. Videos 3 and 4. Final scenes of French episode 1 and Quebecois episode 2. Go to the online version of this article to watch the videos. The next step of the analysis consists of naming the scenes and comparing their lengths between both versions in order to explore quantitative gaps and analyze the differences in terms of time economy. Excel allows one to elaborate a comparative chart between scene lengths (see Figure 9). The purple bars account for the extension of the French scenes and the blue ones illustrate the scenes that were reduced in the French show. The fact that the French reduced the length of certain scenes might call for our attention. The chart reveals that most of the drug related scenes were significantly shortened as to obliterate or minimize the social quandary related to drug use. In total, the Quebecois spent 00:06:12 dealing with the topic of drugs while the French only spent 00:04.56. Hence, the Quebecois spent 00:01:16 more than the French to deal with the topic. Final Cut Pro™ enables superimposing scenes of both versions of Les Bougon to compare them instantly. Clip 3 illustrates the different approaches to address the issue of drugs in each series. Both versions illustrate the patriarch Paul, who scolds his daughter over drug consumption. The scenes differ with its duration: the scene is longer in the Quebecois version (00:00:41 for the French and 00:01:33 for the Quebecois). It also differs with its content: The French one deals with marijuana while the Quebecois deal with cocaine. Lastly, the scene in the Quebecois version is set with a dramatic atmosphere. The use of low-key lighting, dramatic music and the gravity of the actors emphasize the legal, moral and health problems caused by drugs. At this point, the Quebecois show stops being a comedy and turns into a dramedy. Conversely, the French remain on a humoristic and almost vaudevillian tone to alleviate the drama and avoid serious societal implications. Video 5. French episode 1 Scene 32/Quebecois episode scene 21 dealing with drug issue – The French version is on the left, the Quebecois on the right. Go to the online version of this article to watch the video. Finally, the MMA Software enables a more detailed analysis as it provides a quantitative study of the camera work of the drug scene. Among other elements that can be measured, we can look at the camera angles and shot scales. Both elements are critical in filmmaking since they can add either dramatic or comic effects to the shows. Figure 10 shows that the French version contains exclusively eye level point of views (100%), which is quite neutral, while the Quebecois version uses slight high angles (22%) and low angles (26%), illustrating hierarchy and power relations between the characters. In turn, Figure 11 displays the different use of shot scales. The Quebecois show includes a significant amount of close-ups (32%) in order to focus on emotions (in this case anger and shame) and convey the tension that exists between the family members during the drug scene to the audience. Conversely, the French version does not contain any close-ups but features medium close-ups (44%) or wider shots that downplay the anxiety and remain on a humoristic tone. This is just an example of the work that can be done with the MMA software, but many other parameters can also be studied under the light of multimodality and the program seems promising for future study. To conclude, the combination of Final Cut Pro™, Excel™ and MMA™ software prove to be efficient tools to analyze and compare TV series and their transcultural adapted versions in the context of transmutation. Final Cut Pro™ provides a new outlook on narrative structure re-organization as well as time management of scenes. The Excel chart connects the time management of scene with the topics they deal with and the MMA software provides an in-depth analysis of the style difference between both shows. In the case of Les Bougon, the software-based comparative technique clearly reveals differences in the culture of TV series making between Quebec and France. In this part of the collaborative project a 24-minute long episode of the US crime series Dragnet on NBC entitled ‘The Big Seventeen’ is compared to a 44-minute 1958 episode of the German crime series Stahlnetz labeled ‘Die blaue Mütze’ (‘The Blue Cap’). The plot content between the two episodes differs substantially. The Dragnet episode told the story of a teenage drug dealer at a high school in Los Angeles who sold marijuana and heroin to his – middle class – classmates and thus caused a drug-induced crime wave and lawlessness among ‘otherwise reasonable’ youths. The drug-dealing teenager ultimately lost all inhibitions and stole uncut heroin from his dealer, whom he sent to the hospital after an apparently brutal robbery of all the supplier’s drugs. At the end of the episode the teenager was found dead through an overdose of that heroin, lying in a park. Detectives in the German Stahlnetz episode solved a mugging of an old shopkeeper at a soap shop. He was beaten up, robbed, and sent to the hospital by two – working class – youths who needed money to pay for a motor scooter, a status symbol of the Wirtschaftswunder society among youths at the time in 1950s Germany. The detectives attempted to find the perpetrators by identifying the blue cap that was found at the scene of the crime, a cap which happened to be made in the US and thus initially hard to identify by the detectives. These two episodes involved a similar topic high in public awareness at the time: youth criminal deviance and its representation on television and cinema. Also, each episode attempted to create a moral and social boundary between what was considered ‘good’ consumption in the emerging and booming consumer society in both countries in the 1950s (defining and presenting ‘good citizens’ of Wirtschaftswunder Germany), and ‘deviant’ or morally reprehensible consumerism in each society, which in the one case (in the US Dragnet) involved the use of illicit drugs by teenagers, and in the other case (in the German Stahlnetz) a quick and ultimately unearned and reprehensible way of obtaining and paying for consumer goods by stealing and assaulting an old defenseless man. Each episode had a main detective and a sidekick, which later became the paradigmatic formula for the television crime show tradition in each of the respective countries. Finally, the same signature music of the US Dragnet series was employed in much the same manner in the German series. The US weekly broadcast was a primarily studio-based production with only a small degree of external, on-location shots, whereas the monthly German show employed more film aesthetic techniques and a greater amount of external scenes. 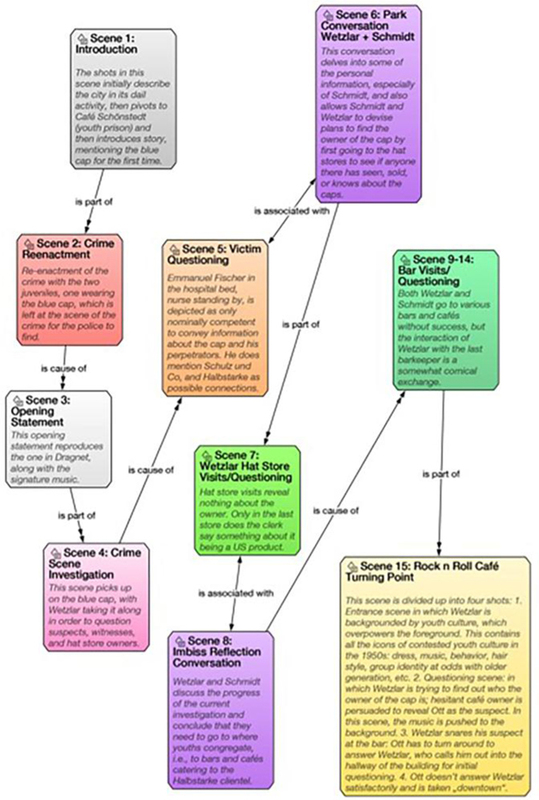 Both crime shows featured a similar genre structure, a comparison of which is featured in a table below: 1) a short introductory segment about the city in which the crime took place, 2) a depiction or narration of the crime – either as enactment or as a recounting, 3) gathering the main piece of evidence (in the case of the Dragnet episode was a matchbox of marijuana cigarettes, and in the case of Stahlnetz was a blue cap made in the USA), 4) the interrogation of witnesses, family members, and ultimately, the suspects, 5) solving the crime, revealing the perpetrators and their motives. In the face of these two divergent texts, the nature of the comparison between them diverged as well from the two other examples, transposed and transmutated narratives, mentioned above. 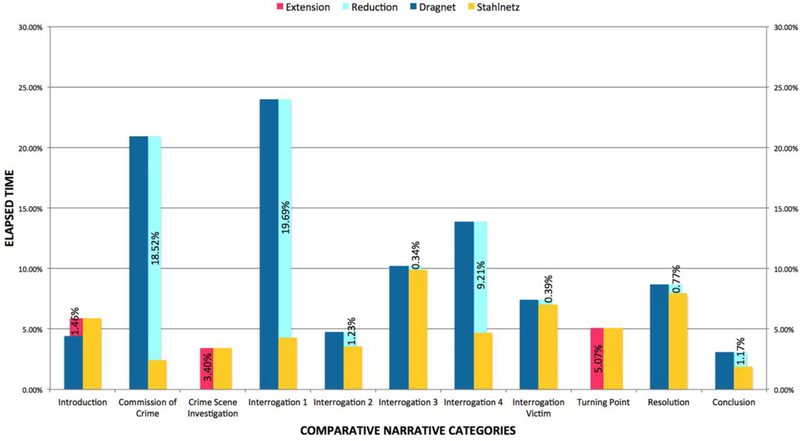 Instead of basing a comparison on the scene-to-scene similarities of narrative structure and linear sequencing, the comparison of Dragnet and Stahlnetz are rooted in the general narrative structure of the crime genre. Thus, comparing the narrative structure means finding and measuring sometimes composite structural equivalents in the non-linear construction of the narrative. This meant simplifying the categories of comparative analysis to create approximate equivalencies, which was done in the bar graph showing the relative length of the components in the narrative structure common to both Dragnet and Stahlnetz episodes (see Figure 12). These are consolidated, not representing a linear sequence, but as conglomerate components and thus enable an approximate comparison. For instance, the bar graph ignores multiple scenes in which the same person is questioned or interrogated, combining these into aggregate numerical values and percentages. The data on the narrative structure and sequencing was therefore gathered using the segmenting function of Adobe Premiere Pro™, and the numerical and percentage results presented and visualized in a table using data exported to the Microsoft Excel™ program. Segmenting narrative with Adobe Premiere entails various steps demonstrated in the linked video segment. After importing the video clip to the Adobe Premiere timeline, the timeline should be stretched to reveal the audio breaks in the audio tracks. Moving the cursor to the beginning or end of the scene will enable inserting the in/out marker (the diamond shaped marker and not the bracket markers) after double-clicking on it. In the marker screen, the segment name may be added to the ‘Name’ field in which first a consecutive numbering system as well as a naming system should be applied. Moving to the ‘Comment’ field, a description of the segment may be added, such as camera, location, action, dialog, music, or other aspect. The next step would be to indicate the appropriate box for ‘Segmentation’ (not the ‘comment’ or ‘chapter’ category. Then one selects the particular color of the segment by checking the preferred box. Finally, one moves to the ‘Duration’ counter (in blue above the ‘Comment’ field), by clicking and holding the cursor while pulling to the right to indicate how long the segment should be on the timeline. This can later be adjusted manually. Then one clicks ‘ok’ to return to the workspace and timeline. If need be, one may lengthen or shorten the corresponding segment above the timeline by clicking and holding the cursor on either the ‘in’ or the ‘out’ marker and dragging it to lengthen or shorten the segment, or to line it up with either the audio or the visual material. The video clip below demonstrates the steps involved in creating the segments on the timeline of Stahlnetz. Video 6. Segmenting the Introduction to Stahlnetz using Adobe Premiere Pro. Go to the online version of this article to watch the video. The list of segments made in Adobe Premiere may be exported to Microsoft Excel, the results of which are illustrated below (see Figures 13, 14 and 15). All of the fields used in segmenting emerge in the exported table as columns, including the ‘Name’ field, which can be renamed ‘Scene Name.’ The ‘Comment’ field can be renamed ‘Description,’ while the coloring can be either retained or modified using the Microsoft Excel colors. In addition, the ‘In’ and ‘Out’ markers are indicated in separate columns as are the elapsed times of each segment. Figure 13. 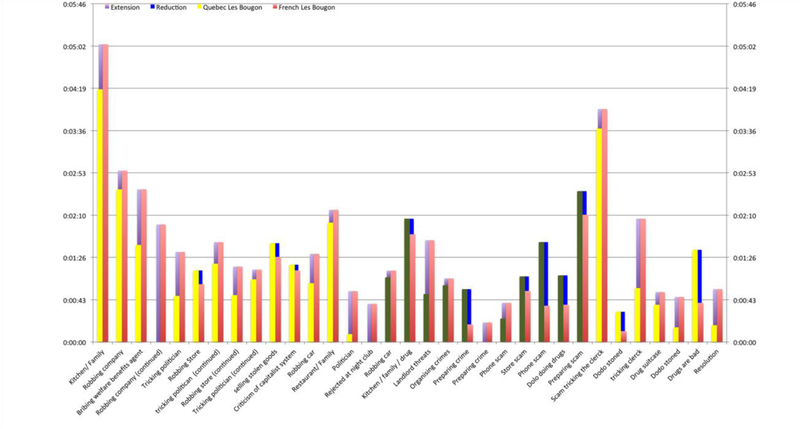 Screen shot of Excel table of Dragnet segments showing color-coded segments on both timelines. Figure 14. Segments created in Adobe Premiere Pro exported to Microsoft Excel table. First page of Stahlnetz segment table illustrating the actual segments and not the abstract scenes in Figure 12. Figure 15. Segments created in Adobe Premiere Pro Exported to Microsoft Excel table. First page of Dragnet segment table illustrating the actual scenes. The visualization of the narrative structure of both the Dragnet as well as the Stahlnetz episode may be created with the ‘networking’ function of Atlas.ti, but we will refrain from going into greater detail due to space limitations of this article, which will focus attention to the segmenting and export of data. The data for the more detailed comparative investigation of the voiceover segments of both episodes were compiled using the segmenting functions of Adobe Premiere Pro in single steps which were then compiled and compared after exporting the data to a Microsoft Excel table and then transformed into a bar graph representation as in Figure 17. The Dragnet episode presents a short linear narrative with 11 scenes that resolve the crime directly as depicted in Figure 8. The main perpetrator, Johnny Demmering, is never visible for the viewer since he has gone into hiding, and during the episode Sgt. Friday (Jack Webb) and Officer Frank Smith (Herb Ellis) are in pursuit of the teenage drug dealer before he can wreak havoc among area teenagers by selling them uncut heroin. Neither Demmering’s mother, Frances Demmering (Vivi Janiss), nor his former girlfriend, Evelyn Maxford (Allene Roberts), have had contact with him until the second to last scene in which Maxford received a phone call from Demmering to meet him in a park. When she arrived, he was already dead from an overdose and was shown unrecognizable lying face up, half in the water in a medium shot. 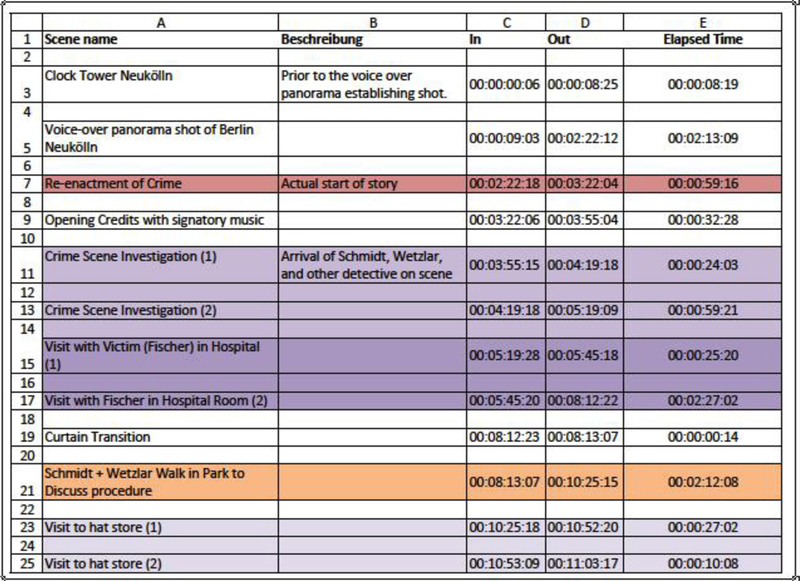 The Stahlnetz episode contains 24 scenes, but consist of two halves (see chart of scenes), the first half in which Kriminalobersekretär (here: ‘Detective’) Wetzlar (Paul Erwin Roth) was consumed with finding the owner of the cap (3), where it was made, and who wore it at the time of the crime. He made countless but futile visits to hat stores, bars, and cafés where youths might gather (later in the screenplay he mentioned that he visited 51 hat stores). The second half is devoted to questioning friends, fiancée, and employers of the two suspects in order to gain a confession, solve the crime, and learn the motivation for it (See Figure 16). This graph indicates the approximate percentage lengths of comparable segments of each episode, revealing the extension of scenes of Stahlnetz (in red) compared to Dragnet, and scenes in Stahlnetz that are shorter than those in the Dragnet episode (light turquoise). The pivotal scene at the mid-point in the narrative was at a café in which rock and roll music (a US product which in 1958 provoked riots in several German cities) is played from a jukebox (made in USA), providing German youths (dressed in the US-influenced) the culture uniform of jeans and leather jackets, dancing with wild abandon to music which almost drowns out the dialog of Detective Wetzlar wishing to speak to the café owner about the cap (5). Video 7. Stahlnetz Rock n Roll Café Shot 1 Teens Dancing to Juke Box Music. Go to the online version of this article to watch the video. The concept of time is significant in the specific construction of the narrative both in the diegetically-oriented Dragnet episode with its radio drama aesthetic, as well as in the Stahlnetz episode based on a mimetic film aesthetic adapted for television. In the short voiceover introduction to the rock n roll scene, Wetzlar announced that no concrete information had been obtained until then about the cap. From this pivotal scene until the end of the story, the two main perpetrators were interrogated, two others questioned, but there was also a three-scene diversion and thus a delay in the resolution of the case as one of the two suspects was not definitively implicated until the very end. For those three scenes, suspicion was placed on another youth who was later exonerated. Voiceovers in both episodes provide an indication of what time a particular step of the crime investigation has taken place, or will be taking place, to introduce a scene or sequence, to summarize the action, create suspense about and contextualize upcoming actions, and sometimes to propagandize particular points of view. Voiceover segments can also be considered time compression devices to diegetically encapsulate sections of the story time which cannot otherwise be enacted. In addition to the voiceover, music was often used as a supplementary time compression device, as were visual cues. Both Dragnet and Stahlnetz included the time and date in these voiceover segments. The Dragnet episode contained 17 time compression voiceover segments for a total of 00:07:05 minutes, amounting to almost 29% of the total dialog of the 00:24:33 long episode, with each voiceover segment averaging 25 seconds. 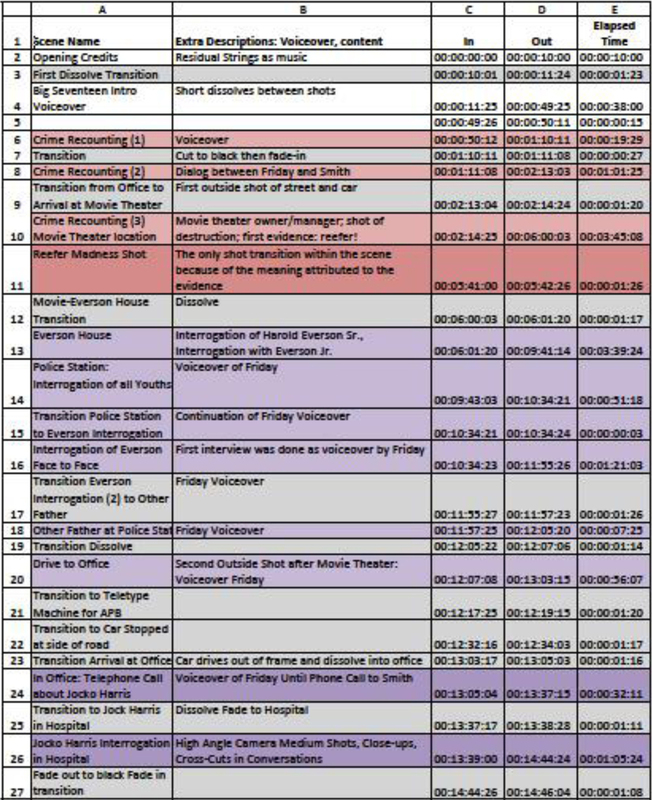 The Stahlnetz episode contained 9 voiceover segments for a total of 00:07:30 of voiceovers, amounting to 17% of the 00:43:56 total episode for an average of 50 seconds per voiceover (see Table 2). Table 2. Number of Time Compression Voiceover Minutes in Dragnet and Stahlnetz episodes. Unless otherwise indicated, time is given in mm:ss. Figure 17. Distribution of Time Compression Voiceover Segments in the Timelines of the Dragnet and Stahlnetz Episodes. The voiceover segments are in yellow. Created using data compiled with Adobe Premiere Pro and exported to a bar graph to Microsoft Excel. One major voiceover segment of the Dragnet episode, a 00:01:12 long segment between 00:11:54 and 00:13:06, is comprised of three or four shots describing efforts to apprehend the main suspect, Johnny Demmering (7). Video 8. Dragnet Time Compression Summary of Investigation. Go to the online version of this article to watch the video. A series of visual shots framed this voiceover, which not only related to the roundup of the teenage drug distribution ring, but also gave a summary of the previous four days of investigation and steps taken to find Demmering. Finally, Friday’s voiceover pontificated about the pernicious supply network set up by ‘vicious’ people to exploit youths and adults. This propaganda contextualized the following scene in which Demmering’s supplier, Jocko Harris (Herb Vigran), was shown, mortally wounded in his hospital bed after Demmering beat him up, stole his supply, and disappeared. Contrary to the victim in the Stahlnetz episode, i.e., the ‘good guy’ Emmanuel Fischer (Albert Kriwat), Jocko Harris is contextualized as the ‘bad guy,’ while the actual portrayal of both victims revealed surprising similarities in the mis-en-scene. Differences lie in the contextualization, Friday’s moral rejection of Harris in Dragnet, while the sympathetic nurse in Stahlnetz urged caution and empathy with Emmanuel Fischer. This can be seen in the dual video clips of both segments of Dragnet (video on the left, audio on the right) and Stahlnetz (video on the right, audio on the left), created with Adobe Premiere Pro™ and converted with Camtasia™. 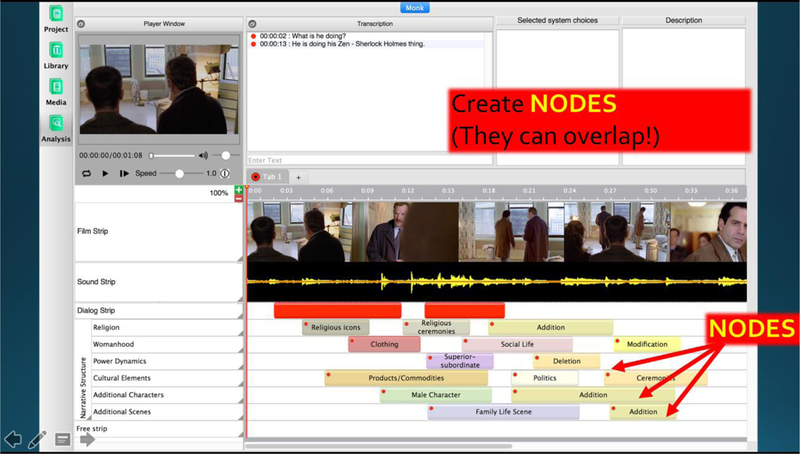 Using the video editing software, and especially Adobe Premiere ProTM for segmenting the narrative structure and content for derived narratives such as the case for the German Stahlnetz episode and the US Dragnet example can uncover quantitative data related to the specific realizations of each version. Thus, the quantitative data on the amount, distribution, and length of the voiceover segments allows for a comparison of these segments and can be correlated with Dragnet’s roots in the radio drama genre which has been carried over into television. The voiceover segments in the Stahlnetz episode, on the other hand, can be traced back to the aesthetic roots of a made-for-television film in which a mimetic approach is predominant in the narrative. While this can be also determined without the use of numerical data, the quantitative information supplements the mere observation, such that one has an objective temporal foundation for analysis and comparison. Comparing the quantitative data on length of narrative segments is somewhat more difficult in our two examples due to the differences in narrative content, but the genre-based approach lends itself to a comparison even with the more abstract and simplified narrative structure in our examples. Video 9. Dragnet + Stahlnetz_Camtasia Scene Comparison_Victims. Go to the online version of this article to watch the video. This overview of our project explains an initial modest step towards incorporating qualitative and quantitative data into a comparative interpretative cross-cultural analysis of two television formats. We believe that this model can be expanded and refined to include many other different types of television formats from a wide variety of linguistic-geographic areas. In addition, this kind of research can be broadened to include not only the pilot episodes, but entire seasons or series to look into the episodic and serial components in many different genres. We believe that the initial focus on narrative structure is a viable approach to incorporating and correlating other kinds of data into a comparative analysis and perhaps ultimately use statistical analysis as a means of cross-cultural comparison. Our own work will continue compiling information on the music and scoring, dialogue, camera work, and correlate these with the narrative structure, sequencing and content. We would like to offer the adaptation typology as a basis for a further discussion of similar work and would be interested in any mutually beneficial international research collaboration, particularly as it involves both television studies as well as the digital humanities. Edward Larkey obtained his Dr. Phil at the Humboldt-Universität, Berlin, Germany in 1986 and is professor of German Studies and Intercultural Communication in the Department of Modern Languages, Linguistics, and Intercultural Communication at the University of Maryland, Baltimore County in Baltimore USA. After publishing two books on the transnational adaptation of US popular music in Austria (1993) and East Germany (2007), his research has more recently focused on the cross-cultural comparison of global television format adaptations combining qualitative and quantitative methods of analysis. Landry Digeon is a doctoral student in the Language, Literacy and Culture Ph.D. program at the University of Maryland, Baltimore County, where he obtained a Master’s degree in Intercultural Communication in 2009. Landry’s research interests involve comparing the transnational adaptation of TV series in Francophone regions. He is currently examining the narrative structures of TV series and applying semiotic theories from the language of film to comparative studies of Quebecois and French film production techniques as they are adapted to television production and editing techniques between both territories. His interdisciplinary research intersects with intercultural studies, digital humanities, media studies and computing. Ibrahim Er is currently pursuing his Ph.D. degree in the Language, Literacy, and Culture program at the University of Maryland, Baltimore County. His research interests in media and cultural studies focus particularly on transnational TV format adaptations, and cross-cultural analysis of multimodal meaning making interventions implemented during their (re)production and (re)appropriation for their respective viewer groups within a dialectic of cultural globalization and localization.